So you’re looking for a fence to add that special something to your home, but you can’t exactly find what it is that you’re looking for. For every fence that you actually look at, there’s something missing and you can’t quite put your finger on it. Sure the picket fence looks good and your grandpa worked so hard to put that chain link fence up when you were a kid. Your neighbor just put up this sweet new vinyl fence, and you don’t want to copy them and their fence. We get it. You don’t want the same thing as everybody else; you want something that screams “This is it!”. Well why not try your own specialty fence? We have a wide variety of specialty fences for you to consider. We have everything from coded entry, to keyed entry. Any fence that requires a unique fencing application can be custom built and designed to fit whatever specification you’d like. These fences are perfect for special projects and for when you just need something extra. Specialty fences can be used for extra security, for design, or they can serve as that boundary. 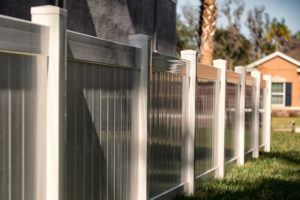 There are several different styles of specialty fences and we can help you find the right one for you.